Back when people relied on film cameras to capture memories, scanners were about the only way to get your printed photos or slides onto your computer’s hard drive for editing, sharing, and archiving. But the move to digital cameras changed that: You can have a hard drive stuffed full of images without ever having plugged a desktop scanner into your computer. But don’t weep for scanners—they’ve remained popular peripherals by evolving with the times. Whether it’s to preserve stacks of receipts, sets of snapshots, or swatches of your child’s preschool artwork, there’s a scanner out there to fill the bill for anything you want to digitize. Today’s scanners are highly specialized, so first you need to consider the type of scanner that will best suit your needs. If you dream of a paperless office or want to digitize your tax files, a document scanner is your best choice. If it’s photos and film rather than receipts that need scanning, consider a flatbed desktop scanner. Document scanners are specialized devices designed to make quick work of removing piles of paper from your desk and putting their contents onto your computer. While a flatbed scanner could perform the same task, document scanners are optimized to complete the job faster and more accurately. When looking for a document scanner, consider the following features. Fujitsu’s ScanSnap has an automatic feeder, making it ideal for scanning in lots of documents. Automatic feeder: If you anticipate scanning stacks of receipts, household bills or multiple-page documents, you’ll want to consider a scanner with an automatic document feeder. Both the ScanSnap ix500 and Brother ADS-2500W have document feeders that hold up to 50 sheets of paper at a time. Just load the scanner, hit the scan button and walk away. Without an automatic feeder, you’ll need to load each sheet individually, which can be a tedious, time-consuming task. Duplexing: Most, but not all, desktop document scanners scan both sides of the page simultaneously. So while the scanner may move through 20 pages per minute, it’s capturing 40 images. Many duplexing scanners are smart enough to delete blank pages when a single-sided sheet is scanned. When scanning double-sided documents, a duplexing scanner will cut scan times by more than half. Resolution: Photo scanners can capture super high-resolution scans of 6400 dpi and more, allowing you to scan a stamp-sized image and create a poster-sized print. Document scanners don’t need that high of a resolution; 300 dpi is perfectly suited toward scanning text and numbers in a way that can be recognized by the scanner’s software so that it gets turned into editable text for your spreadsheets and documents. While document scanners can be used to scan photos, it’s not really recommended. The resolution is limited on these devices, and the paper feeding mechanism could scratch or damage photos. Connectivity: Most document scanners connect to your PC via USB. Many now offer network connections as well. Scanners meant to be shared among a small office might have ethernet or wireless networking capabilities that can free up space on your desk by allowing you to place the scanner in a convenient spot in your home or office. 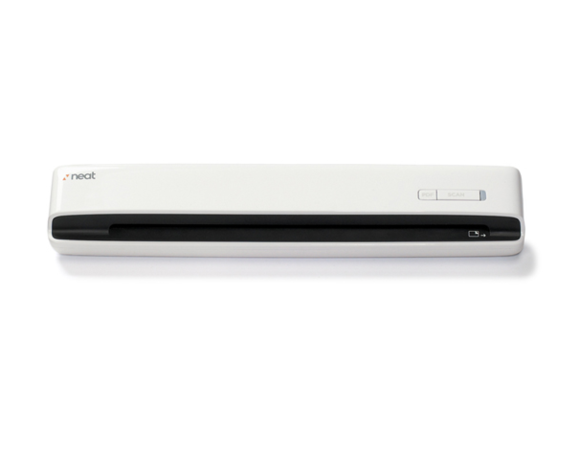 The 10.6-ounce NeatReceipts scanner is built to hit the road with you. Portability: Some document scanners are built to move. They’re small enough to fit in a backpack or briefcase, and can either draw power from your computer’s USB port or run off built-in batteries. Many scanners also have on-board memory or removable camera cards that you can scan to directly. When you get back to the office, you can transfer the scanned files from the device to your PC. There’s a trade-off, though: these scanners lack an automatic document feeder, requiring a lot of user interaction on bigger jobs. Many portable document scanners are simplex devices, scanning only one side of a sheet of paper per pass. Scan to cloud: All document scanners let you scan to a file on your computer. Many will let you set up shortcuts to send the output to a printer to act as a copier or even directly into an email as an attachment. The latest trend in scanning is to incorporate cloud services, where your device can send files to the likes of Evernote, Dropbox, Google Drive, and elsewhere. OCR: Optical character recognition refers to software that can translate an image file into editable text. It’s not an easy job, but unless all you want is a JPEG image of your receipts or bills or contracts, OCR is required to let you edit, manipulate, and search the text and numbers on those sheets in your preferred office application. Surprisingly, not all document scanner come with bundled OCR software, so if this ability is important to you, make sure to check for it, or you might end up paying out of pocket for a third-party OCR application. If you still have shoeboxes or albums full of photos, or rolls of negatives gathering dust in a closet, a photo scanner can help you bring those memories back to life. Desktop scanners are also great for bulky items that can’t fit through a feed, such as books and magazines. You can scan documents too, of course, but most desktop scanners don’t have automatic sheet feeders: you’ll need to manually place, align and flip each document. Epson’s Perfection V550 scanner can preserve any snapshots you have lying around. Desktop scanners range in price from $60 for a basic flatbed to over $1000 designed for professional photographers and graphic artists. Most scanners connect to your PC via USB, though some all-in-one printers can operate wirelessly from their flatbed scanners. Here are some other factors to keep in mind when shopping for a desktop photo scanner. Transparency adapters Transparency adapters, or TPUs, are lights built into the lid of some desktop scanners that allow you to scan film and negatives with provided holders. The scanning software needs to be able to process the images differently—you can’t just plop a slide onto a standard desktop scanner and expect good results. Slides and film sizes vary, as do the scanners’ support for them. If you plan on scanning film and slides, make sure that the scanner you purchase ships with the holder that your media requires. Software: Most scanners come with OCR software, which processes scanned images, turning the words into editable and searchable text. Most offer software with convenient shortcuts to allow scanning to a folder, to email, to a specific application like Microsoft Word, or to a printer to act like a copy machine. Many also include shortcuts, allowing you to scan to any cloud services that you might subscribe to. Photo scanners often provide software tools to help restore color to photographic prints that may have faded due to sunlight or exposure over the years. Resolution: Due to the size of negatives and slides, the scanners capture these types of images with very high resolution. 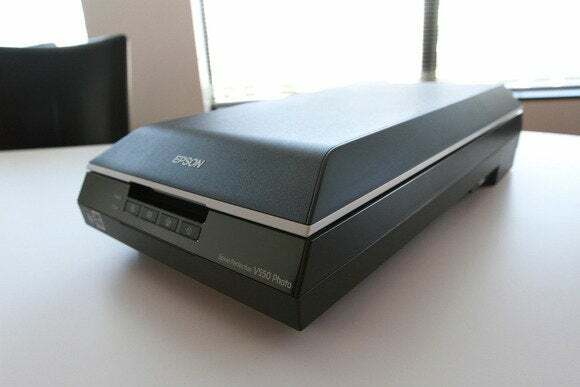 With the ability to scan at an optical resolution of 6400 dpi, the Epson Perfections V550 Photo scanner can let you output poster-sized prints from a 35mm original. The downside to these high resolution scans is that dust, scratches and other imperfections are also magnified. Luckily most film scanners include software to help mitigate these imperfections through digital dust and scratch removal. This is an updated version of a previous article that includes the most up-to-date information as of Nov. 18, 2013. Outfitted with an Eye-Fi SD Card, this lightweight portable scanner can wirelessly transmit JPG images and PDFs to computers, the Web, or your Android or iOS mobile device, making it a useful tool especially for business travelers.